Snow Hill font larger than New Street? Ditto Exeter Central larger than St Davids. Canon Street crossing over Blackfriars route? High Speed 1 into St Pancras: Very confusing around north and east London with sharp curves running over the junctions of other lines; no Ebbsfleet - more important to Eurostar than Ashford. Thameslink into the new St Pancras station box: There appears a new line connecting St Pancras to an unnamed station on the Thameslink line. A poor attempt at relocating the Thameslink station using the symbol for a railway line. Fort William: Junction changed from correct layout to a right-angled shape - why? 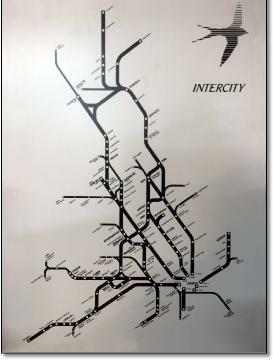 Settle & Carlisle line angle: The new angle of this line has no match anywhere on the map (while the final connection into Leeds is at the original angle); it also makes the connections to Lancaster and Clitheroe wrong, and where's Hellifield? What was previously correct is now wrong. Glasgow - Perth: Why straighten Glasgow - Perth when Edinburgh - Perth is an equally important route (also providing Perths direct connection to London). Chiltern line straightening: The Chiltern line is straighter but only at the expense of the Coventry connection, which is now worse for Cross Country. 1 Inconsistency at junction stations. Some lines approach correctly, some approach from the wrong direction (Reading, London Bridge) and some radiate like stars (Bristol, Leeds, Leicester). 2 No indication of route options when lines cross between stations. 3 CTRL (to Waterloo) shown as a completely segregated railway when it is not. 4 Confusing (and unnecessary) geographic distortion; eg Birkenhead directly south of Liverpool when it is west just over the Mersey, Mallaig north of Fort William when it is west. 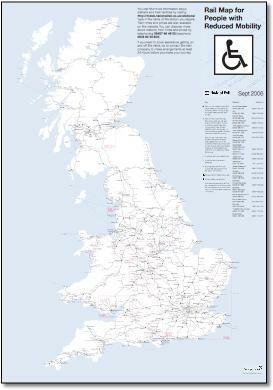 5 London and the South-East perspective: misrepresentation of Scotland in relation to England, over-large space between Yorkshire and Lancashire giving ‘strung-out’ effect. Poor use of space, map doesn’t fill width of sheet. 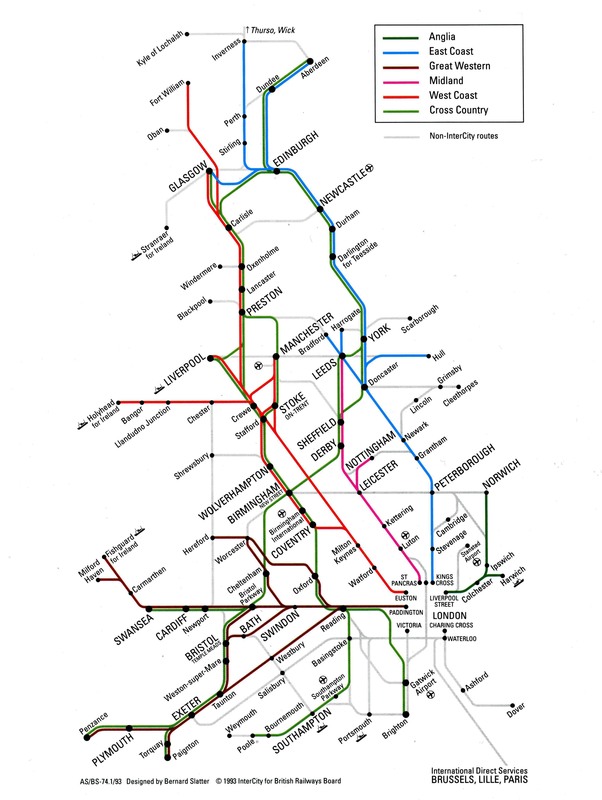 6 Inconsistent level of detail: Liverpool Wirral lines loop and Welsh Valleys but few Glasgow suburban lines; Walsall and Windsor but no Stratford or Pontefract; Birmingham University but no Swinton Interchange. 7 Poor cartography, lacking quality in execution, odd choice of 37.5º; strange coast line with Isle of Wight shown as a triangle when it looks like a diamond. 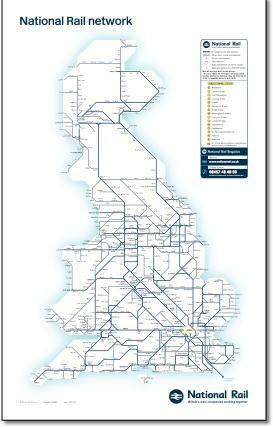 8 Major routes like Birmingham-Poole, South Coast etc., do not look likely routes. 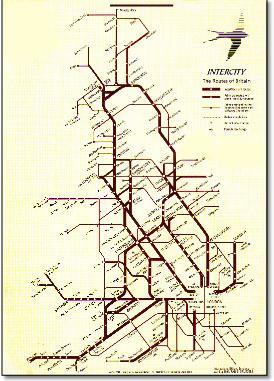 9 Enlargement of the London and Birmingham networks has necessitated a bad kink into the Chiltern main line at Banbury. 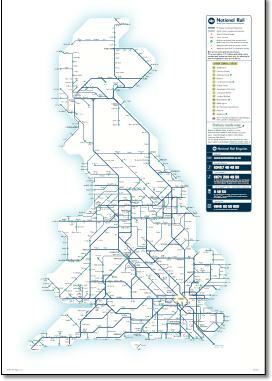 The recently seen 2008 version (on the National Rail website) has High Speed 1 (Ashford - St Pancras) crudely added on. Note 'International' unnecessarily abbreviated to 'Int.' in the key. The airport symbols have probably gone wrong and are too fine, especially compared to the over-large ship symbol. 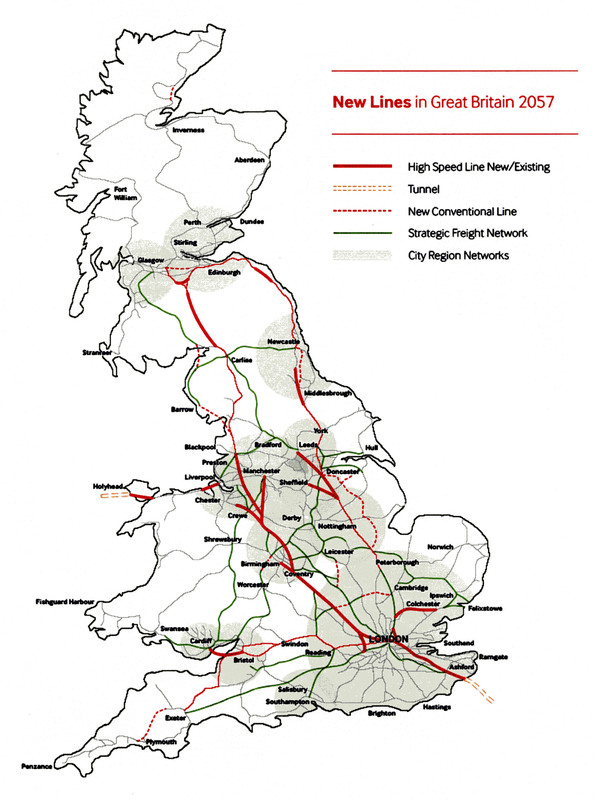 Channel Tunnel services to mainland Europe is now just 'Channel Tunnel services'. Is that a new marketing title? 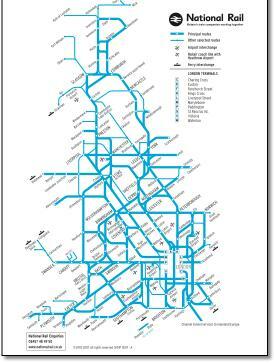 Where the map has failed to prevent station names crossing over lines, two conventions are used, light blue behind Nottingham but white behind Birmingham and Coventry. 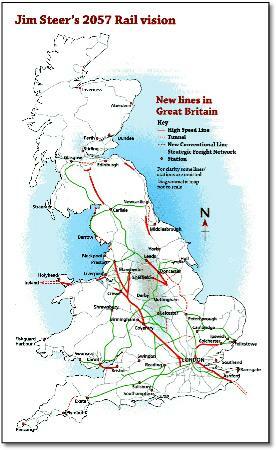 Oxenholme joins the gang as a result of the only other change on the map, the straightening of the Settle & Carlisle. I think this is a very early, if not the first, version of this map. I can just recall a press release in Design Week saying that it was amazing as it looked like the UK. Now a venerable 18 years old. And still used by ATOC. 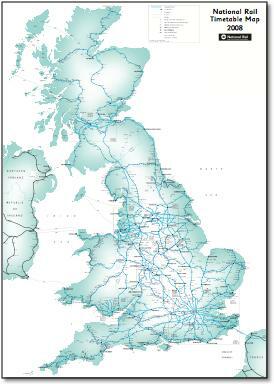 Somebody at ATOC did tell me that the Scots really didn't like the shape of Scotland. 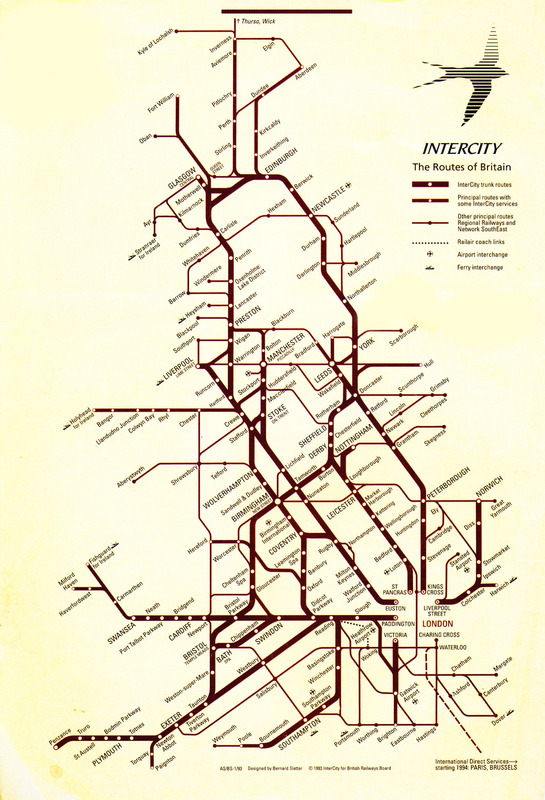 Didn't make much effort with the Far North Line, indicating its existence rather than actually showing it. 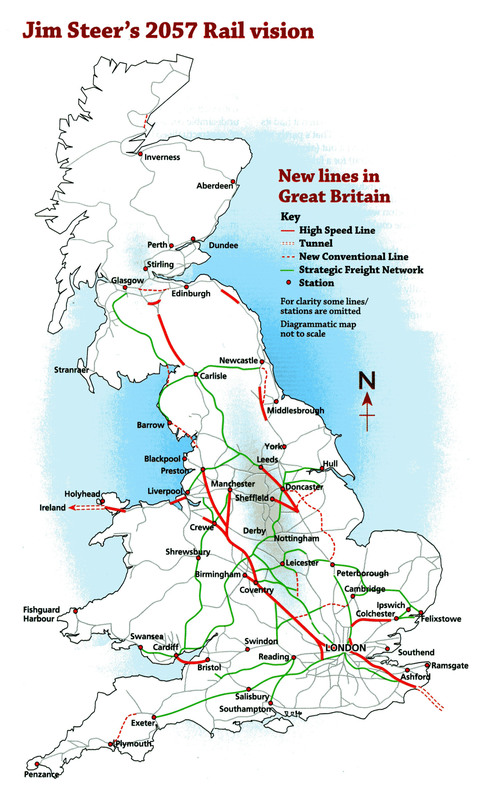 A basic mistake was to not get the north/south alignment of the Lancashire and Yorkshire urban networks aligned correctly such than the overall balance is wrong and that interconnecting lines have to make contortions. 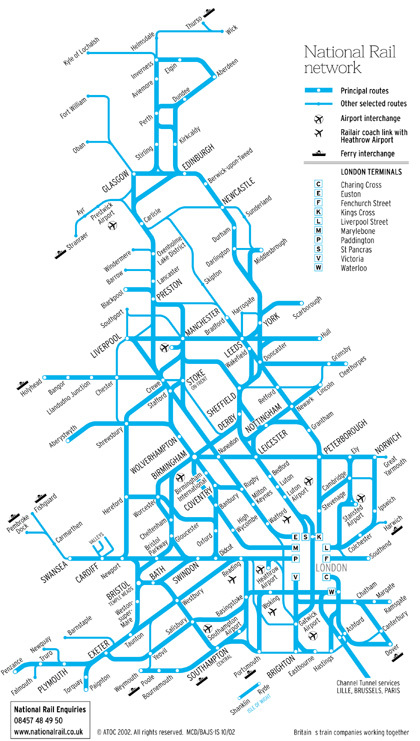 Actually, you can see a design attempt to organise London stations into a grid, but Victoria and Charing Cross should both have been closer to the centre line to get the 'centre of gravity' right - and they could have been. 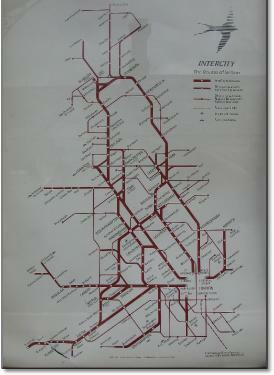 Suggests Peterborough - Norwich is not via Ely. 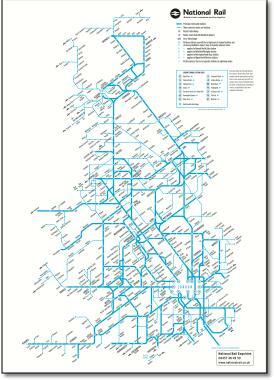 All captions at an angle except London, although all stations named in position - good! 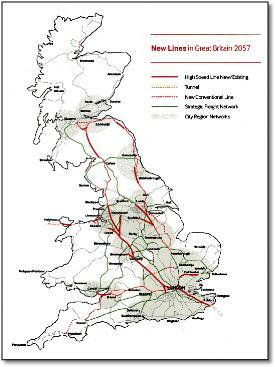 Grudgingly, does give an overview of the network reasonably well (you can see the north east/south west axis!). 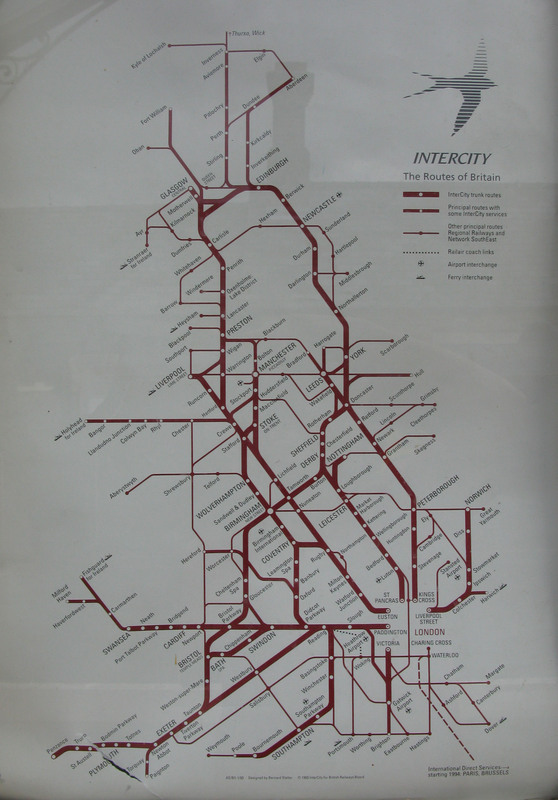 This map made sense when it was a printed sheet with the enlarged complex areas on the back. It did act as the definitive map - it was totally accurate and an indispensable reference tool. 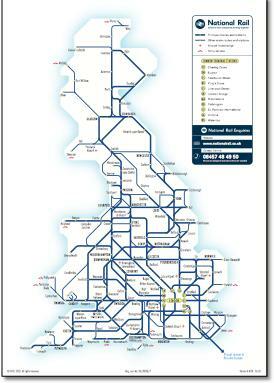 But on its own, looked at on the National Rail website, it doesn't really work. Vast areas do not have any detail and you have to find those other files yourself. And then, lo!, you suddenly have a different schematic style. More thought could be put into this, you could so easily click on the main map to open up the other maps. Or put them alongside on the same document. No thought for the user. The main change on the 2008 map is the addition of the Ebbw Vale branch. 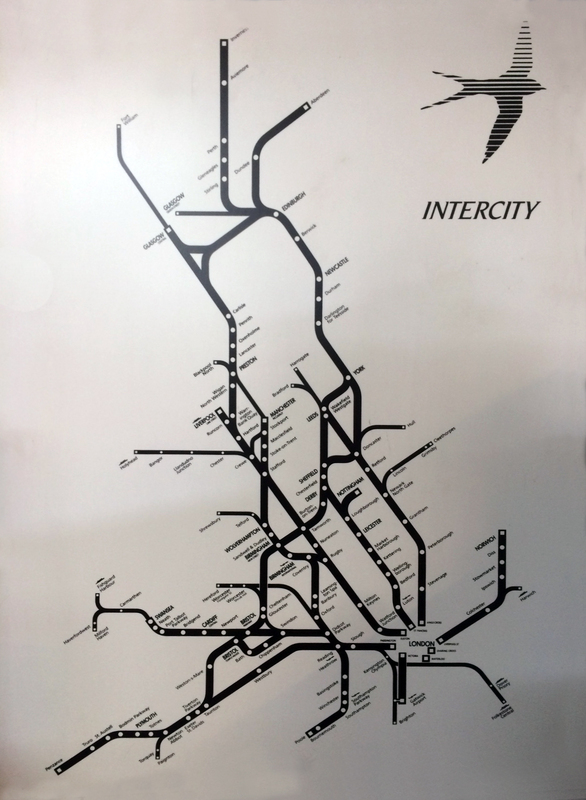 This is badly drawn, looking like it comes off the South Wales Main Line at Cardiff rather than just to the west of Newport - this is, after all, a geographic map. High Speed One (the channel tunnel rail link) is also a bit of a mess, not even going to St Pancras (served since November 2007). Also added is the Allington chord at Grantham. Doesn't show Alloa reopening. Cheaply done by someone who doesn't understand the subject. Shame on you Pindar. 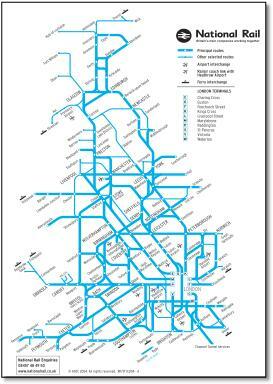 • Doesn't show the Swansea or Barrow avoiding lines, yet shows the Ely curve, Dore south curve, and the Clitheroe - Hellifield line (no regular trains). 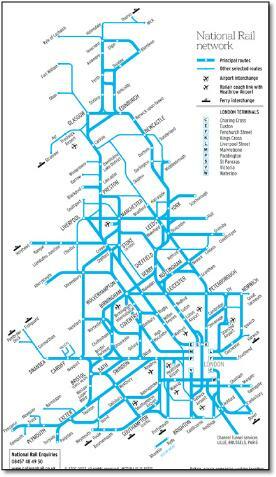 • Four North Staffordshire stations are out of register. • Romsey line joins at Eastleigh unclearly.